In my recent review for Equals, I wrote about the lack of original ideas in today's mainstream movies (again, ignoring experimental films). We feel as if we see the same stories over and over again. It's reached a point where something which seems just the slightest bit novel can be appealing. 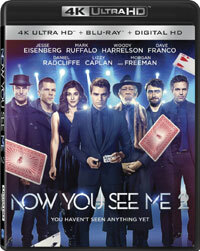 That could help to explain the success of 2013's Now You See Me, which featured magicians who used their illusions to stage elaborate heists. Sure, we've seen magicians as criminals before, but this film added some new wrinkles to that idea by having the bandits act as modern day Robin Hood's. Can this somewhat unique approach make it's way into Now You See Me 2? Now You See Me 2 takes place a few years after the first film. The Four Horsemen, the magicians/thieves, have been lying low, especially Jack Wilder (Dave Franco), who the world believes is dead. Daniel Atlas (Jesse Eisenberg) has been attempting to contact The Eye, a shadowy organization which rules the world of magic, in order to get an OK to come out of hiding. Daniel is very surprised to be approached by Lula (Lizzy Caplan), a magician who wants to join the Horsemen. The group, including Merritt McKinney (Woody Harrelson), is summoned by Dylan Rhodes (Mark Ruffalo), the group's leader who is also an FBI agent, and informed that the time is right to re-emerge. They travel to New York to expose a tech company whose new product can steal data from consumers. However, their big comeback is stymied when they are not only interrupted on stage, but kidnapped. Their abductor is Walter Mabry (Daniel Radcliffe), an industrialist who wants the Horsemen to steal the new tech for him. Can this group use their magic to escape from this madman? In my recent review for The Huntsman: Winter's War, I wrote about the phenomenon of seeing a sequel and realizing that you don't remember the specifics of the previous film. For that movie, it was pretty bad. For Now You See Me 2, it was even worse. I recalled the basic premise, but I'd apparently forgotten everything from the first movie's finale. As if this weren't bad enough, the sequel assumes that we have just watched Now You See Me, as it does little to nothing to refresh our memories. The only explanation given is a throw-away line which is meant to explain the absence of Isla Fisher, who was one of the original Horsemen. One thing that I do recollect is that I liked Now You See Me. It was by no means perfect, but the premise was fresh enough to propel the film forward and there was a nice amount of laughs and twists. Now You See Me 2 takes that goodwill and runs amok with it. This is the epitome of a film which believes in the sequel motto, "If we can't make it better, then let's make it bigger!" The movie spans the globe, going from New York to China to London, and introduces several new characters. The finale involves multiple elaborate illusions performed on a grand scale. However, this is also a prime example of a movie giving us what it thinks we want and instead of what we actually want. I doubt that any audience member went into this hoping for an incredibly convoluted story which not only had way too much happening in the present, but brought in things from the past as well. We are asked to believe that the group would suddenly accept Lula, no questions asked. We are also asked to wait until the ending to see any of the kind of magic which was featured in the first movie. Now You See Me 2 does offer a set-piece in the middle where the group must pass a playing card from one another using sleight-of-hand, but this scene is nowhere near as interesting as the movie thinks it is. The other truly odd thing about Now You See Me 2 is the way in which the public responds to the Four Horsemen. In short, they appear to be the biggest stars on the planet. People recognize them in public, and crowds of thousands gather for their performances? Really? I can certainly see them having a cult following, but having everyone not only know who they are, but seemingly love them truly pushes credibility and reminded me of the sort of silliness which we would see in a Disney Channel movie. Director John M. Chu, who certainly has a diverse filmography, has given the film a very slick look, but he's robbed it of nearly any soul. The only thing worth seeing here, which shouldn't be a surprise, is Harrelson's performance. I won't give anything away, but Harrelson has a lot to do in Now You See Me 2 and most of the time he appears to be in a different movie. (I would have rather watched that movie!) The remainder of the cast is wasted. Also, as in the first film, I have trouble buying Eisenberg as a slick showman. Perhaps it's because he usually plays neurotic characters, but it simply doesn't ring true. I wanted to like Now You See Me 2, but the movie seemed far more interested in being big and loud instead of engaging. Now You See Me 2 only confused me with its fast hypnosis on Blu-ray Disc courtesy of Lionsgate. The film has been letterboxed at 2.35:1 and the Disc contains an AVC 1080p HD transfer which runs at an average of 33 Mbps. The image is very sharp and clear, showing no noticeable grain and no defects from the source materials. The colors look good, and although the film has some dark scenes, the image is never overly dark. The level of detail is excellent and the actors are nicely separated from the background. The Disc carries a Dolby TrueHD 7.1 audio track which runs at 48 kHz and an average of 5.5 Mbps. The track provides clear dialogue and sound effects. This is a very muscular track which really shines during the performance scenes. These scenes deliver impressive surround sound and stereo effects, often delivering distinct sounds which we can easily pick out. The subwoofer effects are also notable, delivering palpable bass. This set also includes a 4K HDR Blu-ray where the film has once again been letterboxed at 2.35:1, and the film is delivered in 2160p. I've noticed that the images on HDR discs are most impressive during brighter scenes. Therefore, the big heist moment looks great here, with an image whose crispness is almost painful to view. The nighttime scenes look fine as well, but their improvement in quality over the Blu-ray don't jump out as much as the brighter moments. The colors look very good and the depth here is impressive, taking on a nearly 3D look at times. The HDR Disc has a Dolby Atmos 7.1 audio track which delivers crisp and powerful audio, very similar to that found on the Blu-ray Disc. The Now You See Me 2 Blu-ray Disc contains several extra features. We begin with an AUDIO COMMENTARY from Director John M. Chu. "The Art of the Ensemble" (21 minutes) focuses on the cast, beginning with the returning actors and then looking at those who have been added for this sequel. We get multiple comments from everyone involved here. "You Can't Look Away" (17 minutes) examines the look of the film from the locations to the production design, with Chu giving details on how decisions were made. "Bringing Magic to Life" (16 minutes) opens with a discussion of the appeal of magic and then moves into how some of the set-pieces were done. We also hear from Consultant David Copperfield.